The Travel + Places topic enables you to manage information for all the trips you plan to take, visitors you will be receiving, and places you frequent or just want to remember. For example, if you’re planning to take a trip to go bird watching, you can plan your daily agenda and packing lists through checklists; set locations for the bird watching areas you wish to visit for better geographical planning; add photos and videos of the birds you’ve seen as media attachments or as a note; add bookmarks to travel and weather sites; and share travel-related information instantly with friends and family. If you want to manage guests coming to your home or business, you can manage the places you wish to visit with them; expenses related to the visit; reminders about the visit; media, such as video or photos; notes pertaining to the visit; and more. For trips and visits, you can also add companions, which enables you to share details of the trip or visit with the group all at once via social media, text message, or email. When traveling with others for work or leisure, this makes communicating with the group easy. Q. How do I manage my trips and places? Trip: An area you plan to go, such as a trip for leisure or business. Can be as small as the grocery store or as big as the Taj Mahal. Place: A place can be a location such as Mavericks Beach on a trip to California. This is a touchpoint to the Places subcategory of the Travel + Places category of Service Providers in the People + Services topic. Visitor: A person who will be visiting you at your business or residence. Travel Notes: Any notes related to travel. Could be a travel journal, notes (including text audio, video, photos, or drawings) about a place you’re visiting or notes from a conference that you’re attending. Travel Bookmarks: Bookmarks to travel-related websites. You can also manage your logins and passwords to travel and airline sites to make finding itineraries and boarding passes convenient. Travel Services: Any services that might be required for travel, such as transportation, parking, or hotel spa services. Touchpoints allow relevant information to be shared seamlessly between Travel + Places and other topics. For example, if you have a restaurant defined as a service provider in the People + Services topic, you can choose that restaurant as a place you wish to take a visitor from Travel + Places. Or, if you have travel- or visitor-related resources such as online documents that are defined in Notes + Files, Lists, you can access those resources directly from Travel + Places. And shopping items and tasks required for a trip or a visit can be defined in Travel + Places and will appear in Shopping + Gifts and Trips + Visitors, respectively. Any travel-related item that’s open and due in the future for five days appears in the Alerts section of the Travel + Places view. Local notifications will also alert you to travel-related items depending upon the reminders that you’ve set up in My Settings. A trip is an area you plan to go, such as a trip for leisure or business. It can be as small as the grocery store or as big as the Taj Mahal. A visitor is a person who will be visiting you at your business or residence. Trips and visitors typically have places and companions associated with them. You can set a location for a trip or visitor or you can associate places with the trip or visitor that have associated locations. 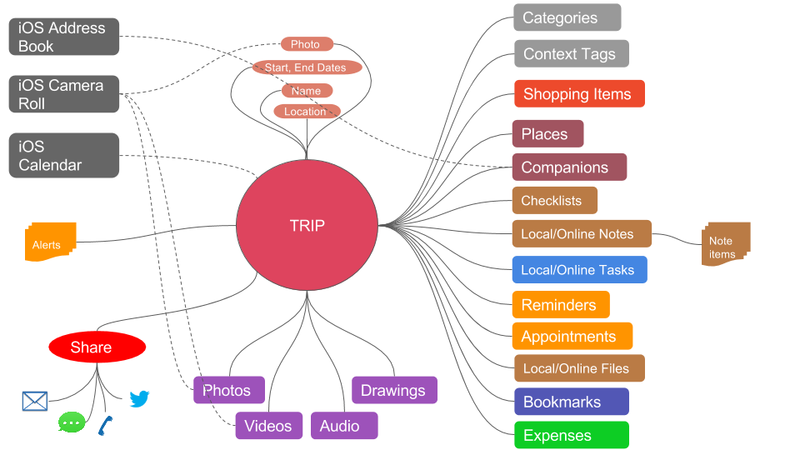 In your LightArrow app, you can associate several types of items to trips and visitors in order to efficiently plan, and to organize in a way that you can easily find the information that you need. For example, you can associate tasks, checklists, appointments, expenses, shopping items, files, and other items with trips and visitors. There is one selector at the top-left of the Trips + Visitors view. It allows you to group by all trips or visitors or by starting date, last updated, or context tag. In the Trips + Visitors view, tap the selector at the top-left of the view. From the selector, choose Ungrouped, Starts, Last Updated, or Context Tags. The app remembers the previous selection. In the Travel + Places topic, tap the plus sign and then select Trip. To quickly create a trip, type a name and start date, and then tap Save. Optionally, tap Full Details to add more information to the trip. Select dates for the trip by tapping the Dates tile and selecting dates from the selector. Tap Set. To add trip companions, tap the Companions tile and select companions from your contacts. Tap the add selector at the top. When the Companions view appears, select companions. Then return to the Trip view. Learn more about Companions below. If you wish to change the iOS calendar that the trip is associated with, tap the iOS Calendar tile and then select Specify iOS Calendar. To add a location for the trip, tap Location and select one of the options. Optionally, add more data by tapping Create and Add More Data. This allows you to associate additional items, such as Tasks, Checklists, Expenses, etc. In the Travel + Places topic, tap the plus sign and then select Visitor. To quickly create a visitor, type a name and start date, and then tap Save. Optionally, tap Full Details to add more information to the visitor. Select dates for the visitor by tapping the Dates tile and selecting dates from the selector. Tap Set. To add visitor companions, tap the Companions tile and select companions from your contacts. Tap the add selector at the top. When the Companions view appears, select companions. Then return to the Trip view. Learn more about Companions below. If you wish to change the iOS calendar that the visitor is associated with, tap the iOS Calendar tile and then select Specify iOS Calendar. To add a location for the visitor, tap Location and select one of the options. Optionally, add more data by tapping Create and Add More Data. This allows you to associate additional items, such as Tasks, Checklists, Expenses, etc. Tap the Trips + Visitors tile in the Travel + Places topic. Tap the trip or visitor you wish to modify and then tap Open. Modify the items as directed. Tap the trip or visitor you wish to delete to expand the row, and then tap Delete. Choose a trip or visitor and open it. Tap the Add icon, tap the contacts you wish to include, and then tap Save. You can manually keep track of contacts who have accepted your invitation by tapping the More Info icon and choosing Not responded, Yes, No, or Maybe and then tapping Set. When they respond, this groups the companions by their response. Return to the Trip or Visit and then save it. Note: You can communicate with all of these trip/visit companions by tapping Share from the associated Trip, and then tapping Email or Text Message. If you wish to remove a companion from a trip or visit, in the Companions view, swipe the companion to the left. You can print individual trips or visits, share trips or visits via email or discuss trips or visits via social media or SMS. Users who receive a trip or visit via email can manage it in their app. Open the trip or visit. Tap the trip or visit you wish to print and tap Open. Tap Actions and then tap Print. A PDF file is created and an alert appears asking if you wish to save the document as a local document. If so, tap Yes, otherwise tap No. Tap the Share icon at the top of the view and then tap Print. Print the document to the selected printer. Note: You can also open the PDF document and save it to an online service, such as Dropbox, by tapping the Share icon and choosing an online service. Tap the trip or visit you wish to share and tap Open. Choose a recipient and then tap Send to send the email. Tap the trip or visit you wish to collaborate about and tap Open. A message displaying, “I’m planning a trip/visit (trip or visit name). Any recommendations?” appears. In your LightArrow app, Places are Service Providers. Refer to Service Providers for more information about creating places. Refer to Notes for more information about creating notes. Refer to Bookmarks for more information about creating bookmarks. Refer to Services for more information about creating services. The Travel + Places topic helps you to be more productive by allowing you to associate tasks, shopping items, appointments, reminders, bookmarks, notes, checklists, files, bookmarks, expenses, audio, photos, video, and drawings to trips and visits. For example, if you’re planning a trip to Maui, you might attach photos during the trip, a packing list (through a checklist), and bookmarks to websites with itinerary or reservation information; and you’ll want to be able to easily see all of these items associated with the trip in one place. By associating these items with the trip, you have a central location to view all of this data. You can associate a trip/visit with a task or a task with a trip/visit. Note: Anywhere you find a task in the app, you can open it, tap its Associated Topic tile, and select a trip/visit that you want to associate it with. Locate a trip/visit by tapping the Trips + Visitors tile in the Travel + Places topic. You can create a shopping item Shopping + Gifts topic and later associate it with a trip/visit in the Travel + Places topic (or) you can add a shopping item directly in the Travel + Places topic. For detailed information about shopping items, refer to the Shopping + Gifts help. If you’re choosing an existing shopping item, tap Shopping Item and select the shopping item you want to add by tapping it. If you’re adding a new shopping item, tap Shopping Item and add a name, amount, and due date/time. Creating an appointment is a common function that can be created in many areas of your app. If you wish to add an appointment directly to a trip/visit, follow the procedure below. Creating a reminder is a common function that can be created in many areas of your app. If you wish to add a reminder directly to a trip/visit, follow the procedure below. You can create a note in the Notes + Files, Lists topic and associate it with a trip/visit (or) you can associate a note to a trip/visit directly from the Travel + Places topic. For detailed information about notes, refer to the Notes + Files, Lists help. You can create a checklist in the Notes + Files, Lists topic and associate it with a trip/visit in the Travel + Places topic (or) you can associate a checklist to a task directly from the Notes + Files, List topic. For detailed information about checklists, refer to the Notes + Files, Lists help. You can create a file reference in the Notes + Files, Lists topic to your local and online files and associate it with a trip/visit (or) you can associate a file reference to a trip/visit directly from the Travel + Places topic. Files can be local or stored online. For detailed information about creating file references, refer to the Notes + Files, Lists help. You can create a bookmark in the Bookmarks + Lockers topic and associate it with an item in the Travel + Places topic (or) you can associate a bookmark to a Travel + Places topic directly from the Travel + Places topic. For detailed information about creating bookmarks, refer to the Bookmarks + Lockers help. You can create an expense in the Finances topic and associate it with a trip/visit (or) you can associate an expense to a trip/visit directly from the Travel + Places topic. For detailed information about expenses, refer to the Finances help. You can create photos, audio, or video within the Media topic (or in some cases directly with your device) and associate them with an item in Travel + Places (or) you can associate a media item with a trip/visit directly from the Travel + Places topic. For detailed information about creating media items, refer to the Media help. If you’re choosing an existing media item, tap Audio, Photo, Video, or Drawing and select the file you want to add.